(circled in yellow) appear black and the sky white in this negative image. Last edited by bystander on Wed May 30, 2018 5:35 pm, edited 1 time in total. <<2015 BZ509 is an asteroid in a resonant, co-orbital motion with Jupiter. Its orbit is retrograde, which is opposite to the direction of most other bodies in the Solar System. It was discovered on 26 November 2014, by astronomers of the Pan-STARRS survey at Haleakala Observatory on the island of Hawaii, United States. It is the first example of a retrograde co-orbital asteroid with any of the planets. It is thought to be an interstellar asteroid captured 4.5 billion years ago into an orbit around the Sun. As of February 2017 its period was 11.65 years and its orbit had an eccentricity of 0.38 and an inclination of 163 degrees. Its period is close to the 11.86-year period of Jupiter. During one Jovian year, Jupiter moves 360° around the sun whereas 2015 BZ509 moves 366.3° in the opposite direction. The eccentricity of its orbit allows it to alternately pass inside and outside of Jupiter's orbit at its closest approaches of 176 million kilometers. Each time it passes near Jupiter its orbital elements, including its period, are slightly altered. Over thousands of years the angle between the position of the asteroid and its perihelion minus the angle between Jupiter and the asteroid's perihelion tends to oscillate around zero with a period of about 660 years and an amplitude of about 125°, although sometimes this difference slips by a whole 360°. The adjunct diagram shows one complete orbit of asteroid 2015 BZ509 in a frame of reference rotating with Jupiter. The view is from the north looking south onto the Solar System. The dot in the middle is the Sun and the green circle is the orbit of Earth. The black circle shows the size of the orbit of Jupiter but in this frame of reference Jupiter (the red dot) stays almost stationary at the point on the circle directly to the right of the sun. The orbit of this asteroid is shown in blue when it is above the plane of the orbit of Jupiter, and it is shown in magenta when it is below the plane of the orbit of Jupiter. The second diagram shows one complete orbit of asteroid 2015 BZ509 in a frame of reference rotating with Jupiter. The view is from side looking into the Solar System. The Sun is the yellow disk in the middle. The plane of the orbit of Jupiter is shown in black, but in this frame of reference Jupiter (the red dot) stays at the right end of the black line. The orbit of this asteroid is shown in blue when it is above (north of) the plane of the orbit of Jupiter, and it is shown in magenta when it is below (south of) the plane of the orbit of Jupiter. Perturbations from Jupiter maintain the stability of this orbit over millions of years. Simulations show that it has been in its co-orbital relation with Jupiter for at least a million years and will continue for at least another million years. It is somewhat of a mystery how this asteroid (or comet) got into this orbit, but it is thought that at some time in the distant past it was put into an orbit resembling its present orbit by an interaction with Saturn, and then its orbit was perturbed into the state it is in today. Likewise, in the far future it may eventually get close enough to Saturn to be expelled from its present co-orbital relation with Jupiter. <<Captain Peter “Wrongway” Peachfuzz made his debut in Jet Fuel Formula, the first Rocky & Bullwinkle story arc, originally broadcast late 1959 and early 1960. (The captain was named for Rocky and Bullwinkle producer Peter Piech.) According to the narration of Jet Fuel Formula, Peachfuzz was, from his youngest days, an incompetent sailor. As a child, even his toy boats sank. At the age of 18 he joined the Navy. He was awarded numerous medals, all of which were donated by the enemy. Sailing the wrong way through the Panama Canal and becoming the only captain of an icebreaker in the South Seas earned him the nickname "Wrongway." After receiving a large inheritance from an aunt, he purchased and took command of the S.S. Andalusia. His crew considered mutiny but decided rather to install a dummy control room, so that Peachfuzz would think he was in command, while the crew actually controlled the ship from another location. Unfortunately, Peachfuzz took a wrong turn and wound up in the real control room. Re: RAS: First Interstellar Immigrant? A statistical search for stable orbits shows that asteroid (514107) 2015 BZ509 has been in its current orbital state since the formation of the Solar System, yet it has a retrograde orbit. This suggests that it was captured from the interstellar medium about 4.5 billion years ago. The hypothesis was published 21 May 2018. If confirmed, it would have implications on current theories such as the detailed timing and mechanics of planet formation, and the delivery of water and organic molecules to Earth. Others suggest that 2015 BZ509 originated in the Oort cloud or that it acquired a retrograde orbit due to interactions with Planet Nine, and that it is a short term resident of its current resonance. ...especially if that time goes back to when the Sun was surrounded by its birth siblings. Yeah, that makes sense. The thought that the odds of interaction between systems would have been much higher back when the Sun was still part of an open cluster had occurred to me too ..., but this idea hardly proves beyond reasonable doubt that it's interstellar. Therefore I think the claim is questionable. Perhaps likely, but still speculative. Claiming that this is a definitive discovery of an interstellar origin for this body is going too far I think. I don't think anybody is making such a claim. The only thing that is certain to a high degree of confidence is that it's been in its current orbit for about a million years. Beyond that, the discussion becomes statistical in nature. Claiming that this is a definitive discovery of an interstellar origin for this body is going too far I think. A new study has discovered the first known permanent immigrant to our Solar System. The asteroid, currently nestling in Jupiter’s orbit, is the first known asteroid to have been captured from another star system. That's a confident claim of discovery. I always ignore what press releases say. They don't typically reflect what the scientists themselves say, as you can see if you go to the actual sources. I always ignore what press releases say. its parent bodies (i.e., Jupiter & Sol) and 'put into foster care or whatever'. So then since this object is now shown to be a comet, is the elongated shape easier or harder to explain? 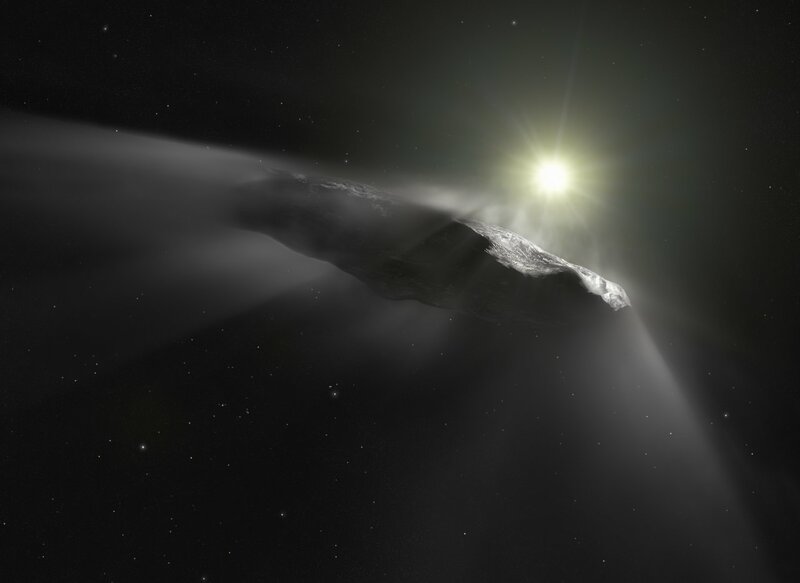 As comets go 'Oumuamua is extremely weak in activity level. That suggests to me that it may have made a great many close passes by the star/stars of its origin system. Well, we don't have a clear distinction between comets and asteroids. There's a gray zone of overlap- comet-like asteroids and asteroid-like comets. Presumably there are different populations of objects defined by their formation environment, not just two. When they call this object a "comet" all they're saying is that it's outgassing volatiles. But asteroids might do that, too. In fact, we might expect that of very young asteroids. So this could be an asteroid-like body that was ejected from its stellar system very early, or a comet-like body that was ejected much later, after losing most of its volatiles. I get the idea that outgassing could change 'Oumuamua's velocity; but I understand that the object is tumbling. Therefore how would any outgassing have a useful constant direction? Could the outgassing be so rapidly responsive e.g. to the Sun's heat that it still manages to outgas preferentially on its sunward side? At the moment my mental image is of a slow motion firecracker with no constant outflow! ʻOumuamua's hyperbolic trajectory left it moving on an exiting trajectory that is almost perpendicular to it's entering trajectory. Assuming that it is basically rotating around its minor axis it is likely that that fixed axis was pointing in the general direction of toward or away from the Sun either on its inward trajectory or (more likely) its outward trajectory. Tumbling doesn't mean some kind of random rotational movement, it simply means rotating on two axes. So unless the outgassing was perfectly isotropic (which is unlikely), there's still be a net thrust vector and consequent deviation from a purely ballistic orbit. These are helpful, thanks to both. I guess observers will always be on the lookout for variations in rotation as well. Tumbling doesn't mean some kind of random rotational movement, it simply means rotating on two axes. So unless the outgassing was perfectly isotropic (which is unlikely), there's still going to be a net thrust vector and consequent deviation from a purely ballistic orbit. So, we're trying to find, so to speak, Oumuamua's Papa? I think there's a song about that.